Daníž association in cooperation with the State Environmental Fund of the Czech Republic implemented a project to build a tourist infrastrucre within the village cadastral territories located in the protected zone of the National Park Podyjí: Hnanice, Havraníky, Znojmo-Popice, Znojmo-Konice, Nový Šaldorf-Sedlešovice, Znojmo-Hradiště, Mašovice and Podmolí. Thus was established a new educational trail and in the villages were placed outdoor information boards with double-sided panels. On one side are photos and print trailers for the specific village and on the other side are photos and texts about the fauna and flora in the National Park Podyjí within the village. Shallow artificial pool, subsidized with water from rainfall, is covered with wetland vegetation. Occurrence of two branchiopod species at the northernmost limit of their range. Natural Monument. Nature reserve Karlov is one of the oldest in Znojmo area. It is a remain of natural oak, hornbeam and maple woods surrounded by large acacias. At the heart of the protected area is deciduous trees vegetation, dominated by oak, hornbeam and small-leaved linden. The age of the trees is between 80 to 150 years. There is also a number of rare plants. Through this area leads educational trail „Údolím lásky“ (Valley of Love). – Water and wetland habitat by Božice creek including one pond and two pools have become a relaxing area for locals and for tourists. Gone are self-seeded acacias and were created paths for cyclists and benches for pedestrians. The trail will take you through the charming surroundings of the Příční stream and a couple of ponds and the classicist Hraběcí studánka (fountain). In spring you can see thousands of snowdrops blossoming there. Not far away is the only nesting place of rooks in South Moravia. The protected nature spot Mandloňová mez (Almond Tree Balk) protects the only place of the occurrence of low almond tree in the Znojmo region. The are represents an important habitat of amphibians and is an important nesting place of wetland birds. 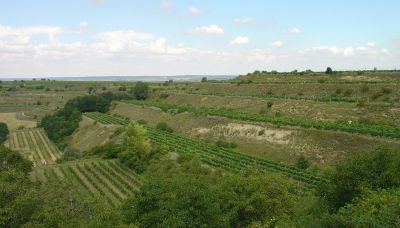 The national protected nature monument protects a site of the occurrence of thermophilic plants south of Miroslav. In early May, hikers will find carpets of blossoming globe daisy (Globularia elongata) there. On most of the area has created wetland plant communities with dominant canebrake. In the northern territory are wet meadows. Forest has a character of soft flood plain. Two small sand pits on the northeastern slope of Olbramovice upland. In the walls of the sand pits a colony of Sand Martin. – with thermophilic vegetation on the isle of crystalline limestone with rare plant species. Most of the area is covered with xerotherm steppe plants. – a place of occurrence of the rare sand iris.